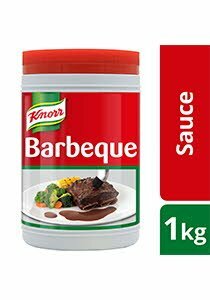 Knorr Barbeque Sauce is the ideal pour-over sauce for popular grilled dishes such as BBQ chicken and grilled salmon. It can be used as a marinade, or dipping sauce for fried food too. Water, tomato paste, sugar, vinegar, vegetable oil, salt, nutmeg powder, vegetable stabilizer, natural identical barbeque flavour (contains peanut oil), cumin powder, onion powder, mustard powder, tamarind powder, natural colorant caramel class III, natural flavour (smoke, cinnamon&black pepper), turmeric powder, chilli powder, preservative sodium benzoate, paprika aquaresin. May contain traces of cereals containing gluten, soy, egg, dairy, shrimp, fish, mustard, peanut. 1. Use as a marinade - Combine 100g Barbeque Sauce with every 500g meat and marinade for at least 2 hours before cooking. 2. Use as a basting sauce - Use 40g of Knorr Barbeque Sauce for every 200g meat or chicken. 3. Can also be used as a dipping sauce.